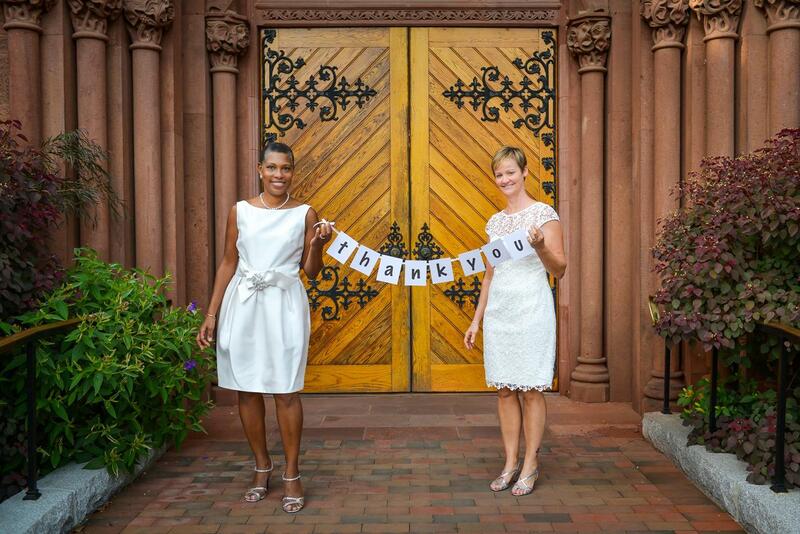 We just wanted to thank you for doing such an amazing job with our wedding at the Jefferson Memorial. We were both very impressed with your command of the situation (especially securing the prime spot at the base of the memorial steps from the park rangers). We received loads of compliments on you from our guests. The day could not have been more perfect, and we thank you for the huge role that you played in that. Jeff was fantastic! The combination of an officiate and a premarital counselor was an excellent way to ensure Jeff knew more about us while also strengthening our relationship and increasing our communication. The premarital counseling sessions were helpful, especially around the time we moved in together – it gave us a chance to discuss issues with a “moderator” and helped us both see the other person’s point of view. As an officiate, Jeff is extremely versatile. After our premarital counseling sessions, Jeff created a draft ceremony based on what he thought we might like (it was spot on!) and gave us the chance to tweak it to our liking. He brought humor to the rehearsal and included several important tips to ensure that the ceremony went smoothly. He has a clear and commanding voice that demands attention from the guests. After our ceremony, all the guests raved about how great Jeff was. I highly recommend Jeff – he made our ceremony perfect, and has given us the necessary tools to start off our marriage right. Thank you for blessing our marriage! You were so amazing the day of the wedding and totally organized. You will always be our first recommendation to future brides and grooms. You are a great person and forever in our prayers and will never be forgotten! Thank you again for everything. I can’t say enough good things about Jeff. We had back-to-back Hindu and Christian ceremonies at our wedding. Jeff officiated the Christian ceremony, although he also has experience officiating Hindu weddings. Many of our guests had never attended a Christian ceremony and they raved about Jeff afterwards. He performed a short but meaningful ceremony. He was kind, funny and very professional. I highly recommend him as a wedding officiant. Thank you so much for all of your help with the ceremony and your flexibility with the weather!!! I think everything went great. The ceremony ended up beautiful inside – a lot of our guests made comments about how intimate and romantic the setting was with the rain on the windows and everything. Many guests also commented about how much they liked the ceremony. Quentin and I couldn’t have been happier with how everything went. Thank you so much for officiating our ceremony. From the beginning when we met you we felt comfortable and like you were the perfect fit – probably because you’re a fellow Michigander. Thank you so much for helping us put together a personal and unique ceremony. Weill always be thankful and remember your important role in our special day. Thank you for helping us realize our vision. The wedding ceremony you performed was a spectacular success. You were awesome to work with. absolutely perfect and far exceeded our expectations. Your professionalism and ability to keep us in check was greatly appreciated. We received lots of comments from our guests on how much they enjoyed it. And thank you for working with us and incorporating all our requests, it really made it feel like it was “our” ceremony. We’ll be happy to pass your name onto all our engaged friends! You performed a beautiful ceremony for me and Jesse. We have received many compliments on the content of the ceremony and your presentation. The ladies were impressed with your knowledge of wedding gown trains and bustles. We enjoyed working with you. We wish you all the best! Thank you for everything, the wedding was amazing. Thanks for everything you did for us. The wedding was absolutely beautiful. Our friends are still commenting on the ceremony. You did such a beautiful job and made us feel so comfortable. It was wonderful working with you. Michael and I wanted to say thank you so much for making our dream wedding a reality! Everything was spectacular. We received so many compliments and thanks from our friends and family. Your professionalism, level of commitment, and expertise were truly appreciated. We enjoyed working with you and wish you all the best. Thank you so very much. I just wanted to say Thank You for such a wonderful and memorable wedding ceremony. All of our guests commented on how touching and funny you were! We just wanted to say thank you for all your help with the ceremony. It was absolutely perfect, and everyone said it was 100% “us.” We couldn’t have asked for a better wedding! Thanks Jeff for going with the flow of the rain. We really appreciate it. Your quick thinking and creativity kept everyone dry and provided a wonderfully intimate wedding ceremony. You were the perfect officiate for the wedding. You were professional and set the perfect tone – touching and intimate with just the right touch of humor. We were so privileged to have you perform our ceremony. Thank You so much. Thank you so much for being a part of our special day. The ceremony was so beautiful! It was meaningful and fulfilling. You made it a very simple process from beginning to end. Thank you again. I wanted to reach out to you and say thank you so much for your services on our big day. It was amazing and although I’m not a crier, somehow it happened ….but in a good way of course :). You made it funny yet warm and it was a moment that we will always remember. Thanks again. Mike and I wanted to say thank you for helping make our wedding such an unforgettable day. The ceremony was so beautiful and meaningful and it will be something that we will remember for the rest of our lives. THANK YOU SO MUCH, for making our wedding ceremony a lifetime moment that we will never forget! It was such a wonderful and emotional moment for both me and Boyan. Even though we were very nervous we felt much more confident because of your sense of humor and self-control. Also the relatives from Bulgaria (on the webcam) want to thank you for making our wedding an unforgettable moment. Thank you so much for the wonderful ceremony for Katie and Walter last Sunday. We were so happy that they were able to find someone they could really connect with to marry them. Thank you for being there to guide them and us through it all.